A number of brightening products make up my skincare routine at any time since I'm constantly on a quest for a luminous complexion and vanquishing the freckles/dark spots on my face. I'm actually currently using four as we speak so when I had a chance to add the Equitance Brightening Serum + Spot Corrector, I couldn't pass it up. 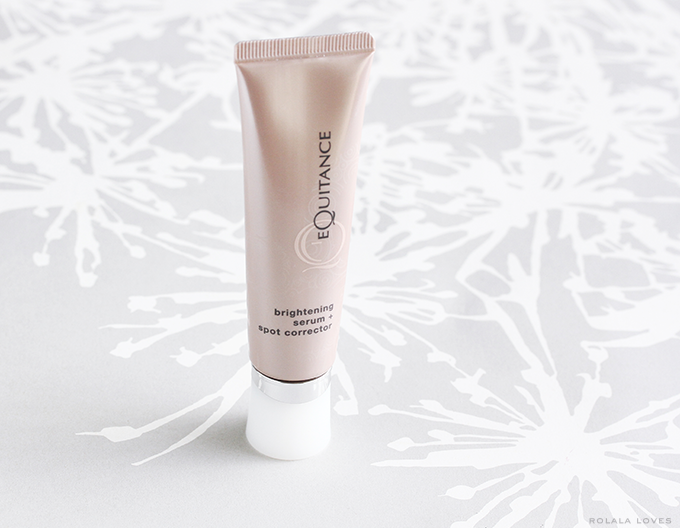 This product is part of the Equitance Brightening System and Equitance is a brand which has been on my radar for awhile. About the Brand: Rooted in Japanese traditions and inspired by beauty in nature, Equitance was founded in Japan 18 years ago on a quest to uncover the mysteries of radiant beauty. Today the company's landmark research has culminated in an exclusive pathway to vital vibrant skin. Representing the best of Eastern and Western research and practices, Equitance Skin Care brings precisely balanced botanicals and clinically proven technology together to continuously brighten the skin. Key Ingredients: Linoleic Acid is extracted from safflower seed oil, purified and put into an exclusive brightening system to target the appearance of dark spots and improve skin brightening and radiance. Ascorbyl Glucoside is a vitamin C derivative with skin brightening properties. Cherry Blossom Leaf Extract which possesses properties to soothe and soften rough skin is culled from Japanese sakura trees. Shell Ginger Extract which is derived from the Japanese alpinia speciosa leaf has intense moisturizing properties to help brighten skin. Packaging: An elegant looking rose gold colored stand up tube which you squeeze to dispense the product. I prefer tubes in general since they are hygienic and you can cut them open when you get towards the end so as not to waste any product. Price: $125 for 1.0 fl. oz./30g. My Impressions: I've been using the Equitance Brighthening Serum + Spot Corrector on just my spots rather than my entire face. The instructions suggest applying 2 to 3 drops onto the face/neck or targeted areas of concern. The product has a silky, slightly watery texture that feels cool and absorbs smoothly. The scent is barely discernible and smells faintly floral to me. I didn't have any issues with irritation since incorporating it into my skincare regimen following my toner. I haven't really been using the serum for long enough to really see any visible results but I have high hopes that it will work and improve brightness given the impressive clinical results in which 83% of women saw a diminished appearance of dark spots after four months and also because the entire Equitance line is dedicated to promoting radiant beauty. It is a tad expensive but if it really works as well as the claims, then I think it can be worth it. To learn more about Equitance and their line of products, visit their website. You can also connect with the brand on Twitter or Facebook. 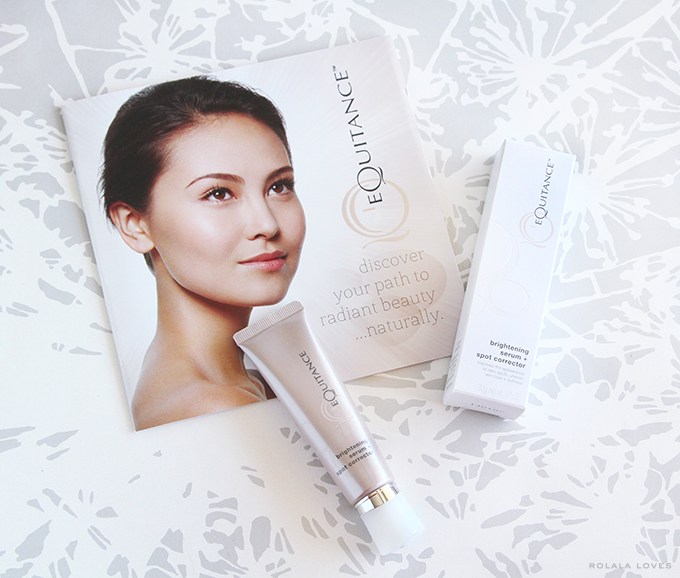 Equitance is offering 15% off the Brightening Serum + Spot Corrector along with a free Equitance Skincare Trial Kit worth $37 with the code INFL15 through 11/20/14. What are your skin concerns if you have any? What do you use to treat them? Disclosure: A complimentary product was provided through Influenster for the purposes of this review. There was no other compensation and all opinions expressed are my own. A lot of people writing product reviews, do those products come from the sponsors ? Oh, what a luxurious product! The packaging is really nice and to be honest, I prefer tubes for cosmetics too. I don't use any brightening serums and to be honest, I don't know much about their properties. I believe that this product really works. Happy Friday! this is a good product for me! This brand is new to me the product looks very interesting, after read your review sounds like a niceserum. Great produts. It seems good. Have an awesome weekend my beautiful Rowena. Perfect review... I need this product!!! Today my skin acted out...I'm not sure why...All my life my skin has been oily or normal, but now occassionaly I suffer from dry skin. This serum seems like a good product. I've heard of this product before and I realy want to try it out! This brand is new to me and this was therefore a helpful review. I tend to opt for fragrance free products but this has a very light fragrance and sounds like a good quality serum. thanks for the review! the product sounds lovely! bookmarking! Sounds like a lovely product, but expensive indeed! Nice review. It sounds like such a great product; awesome review. I have your same skin concerns, I'm looking for a brightening serum for sensitive skin! As you have said, the expense would certainly be worth it if it works as well as it claims to! I look forward to hearing in the future how you feel about the product after longterm use :) Have a lovely weekend, Rowena! ps. lovely photos, by the way! Hmm this sounds promising but yes expensive. I was in Birch Box today looking for a serum but didn't end up getting anything I need to go back. Have been using retinal cream twice a day but I think it is too drying to use twice a day. I'm always interested in hearing about brightening skincare. Equitance sounds great being non-irritating since these regimens requires a certain period of time to see visible results. I'm currently on a trip and using my travel set of Kose Sekkisei Excellent line, but I will resume my Tacha regimen soon. I have not personally heard of this brand, but it does sound really promising and like you, Rowena, I do love to diminish two of my stubborn dark spots and are always keen on products of such. Besides, the packaging looks simply lovely, I love tube as well simply for the same reason and easy to carry around if one travels. I have never tried a brightening serum before. It sounds interesting. Although it takes a long time till you see any results (4 month). I'm quite impatient. Have a happy Saturday Rowena!! I didn't know that a cream for brightening specific spots existed. Sounds very interesting. Oh the joy of trying to find the perfect product! I've been having issues with my face lately. I definitely think I need a spot corrector. I'll have blemishes FOREVER and then the marks from the blemishes FOREVER. I hope this works out for you! It sounds lovely, I hope this works. I have so many marks from spots I wish I could get rid of! that's awesome you're not having any sensitivity issues. that was my problem and i stopped. i may look into purchasing this.